Here are the Kollywood movies which will be telecast on leading Tamil channels like Sun TV, Vijay TV and Zee Tamil on Puthandu. Vijay Sethupathi's Seethakathi is a cricially-acclaimed movie, directed by Balaji Tharaneetharan. The movie is about a veteran theatre artist who forays into the world of cinema. Varun Tej and Sai Pallavi's Banumathi is the Tamil dubbed movie of hit Telugu hit film Fidaa. The movie revolves around an NRI and a village belle, whose relationship went through a lot of troubles, leading them to part ways, but destiny brings them together. Jayam Ravi's Adanga Maaru is a thriller, directed by Karthik Thangavel. It is revenge story of an ex-cop who avenges the death of his loved ones. Hari's Saamy 2 stars Vikram and Keerthy Suresh in the leads. It is an action thriller story about a cop seeking revenge against those who killed his parents. RJ Balaji's LKG turned out to be a surprising hit at the box office. It is a political satire which is a humorous take on the current-day politics and politicians. 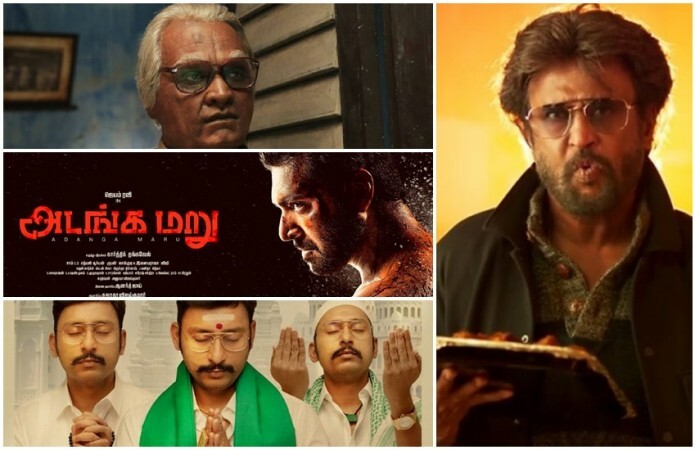 The biggest among the festival movie is Petta, which is credited to be the highest grossing movie of 2019 in Kollywood. It tells the story of a warden who has pledged to save the life of his loved one from enemies. Prabhu Deva and Ditya Bhande's Lakshmi is musical dance movie. The movie tells the story of a 10-year old girl, who dreams to win a competition. Zee Tamil has preferred to screen 2.0 once again it a matter of a week. The Rajinikanth-starrer was telecast last weekend. The movie is a sequel to 2010 blockbuster Enthiran – The Robot. It is a science fiction which throws light on the electo-magnetic radiation caused due to mobile phones.